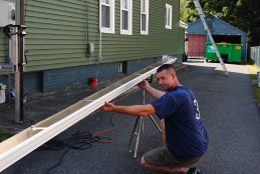 Dow Gutters has been providing gutter guard installations, to homes and business, in Cheshire, CT for nearly twenty years. We understand that removing debris and leaves from clogged gutters can be a dangerous job, so to avoid having to do so, consider installing gutter guards! Our gutter guard systems will prevent clogging and the potential for water or snow from building up in the gutters causing more serious property damage. All of our gutter guards come in a variety of colors to match your existing gutters and downspouts. Our crew is licensed and insured and we guarantee you will never have to clean your clogged gutters again!